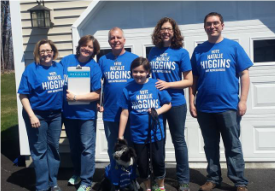 Natalie Higgins is a lifelong Leominster resident, Boston-educated attorney, and director of a non-profit organization, who is dedicated to service and advocacy. Natalie is running for State Representative for the 4th Worcester District (Leominster) as a Democrat. A 2006 graduate of Leominster High School, Natalie obtained her Bachelor’s degree in Political Science from UMass Amherst, earned her law degree from Northeastern University School of Law and was admitted to the Massachusetts Bar in 2014. Natalie volunteers at Pathways for Change where she initially served as a counselor for victims of sexual violence. She also led Pathways' prevention programming, teaching local middle and high school students as a Teen Counselor and Educator. She continues to serve on Pathways' Board of Directors, where she was elected Vice President in 2015. Natalie is excited to have the opportunity to serve her hometown and represent the people of Leominster as the State Representative for the 4th Worcester District. She knows the importance of her traditional Leominster roots as she comes from a long line of Leominster residents. Many people know her paternal grandmother, Bessie Higgins, as one of the longest-serving staff at Hannaford’s, (formerly known as Victory Market) on Lancaster Street. Her maternal grandfather, Philip “Buddy” Bachand, was quite a city servant throughout his life, as a Foreman of the DPW, President of the Friends of Barrett Park, and volunteering for a number of other organizations in Leominster. Natalie’s parents own an independent auto parts store that epitomizes a family-run, mom-and-pop shop. You’ll still find Natalie there a few Saturdays a month, helping out when she can. Will you join Natalie's Team? ﻿We believe that Natalie is the voice Leominster deserves and we're building a team to make sure Natalie becomes our next State Representative.